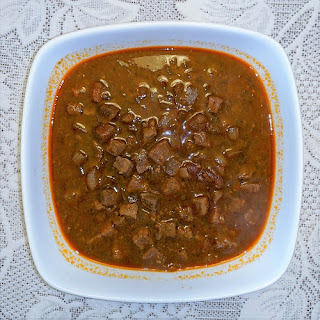 This variant of the sudado de carne is typical from Arequipa, in the South of Peru. Put the oil, garlic, cumin and aji panca in a pot on low heat. Cook for 3 minutes, stirring frequently. Add the meat cut in small dices (approx. 1.5 cm or 1/2 inch) and the black pepper and mix well. Cover the pot and let it cook on medium temperature for 10 minutes stirring once or twice. Add the tomato, bay leaves and beer and let it cook for another 5 minutes. Add the onions and 1 tablespoon of diced rocoto (or 1 teaspoon of ground cayenne pepper) and let it cook for 3-5 minutes until the onion is soft. Serve with your favorite crusty bread (ciabatta, French baguette or Kaiser roll), in order to dip the bread in the stew. Put the remaining rocoto in a small bowl to add it to plates at will.